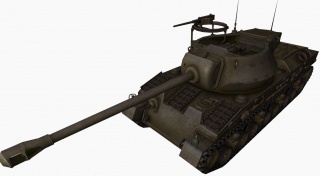 The T28 Prototype is an American tier 8 turreted tank destroyer. The T28 Prototype has a decent gun, good penetration and a useable ROF. Like the T28, the Proto is very very slow, if caught in the open there is no chance to survive and reversing will do no good. 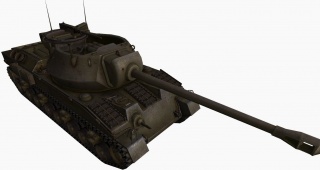 You do have good armor; however it is not as good as the T28, yet it received an closed top in 9.14, making it slightly less vulnerable to HE and artillery. Do note that although it has a turret, it can not rotate 360° and is very slow, meaning it will not help much against circling enemies. 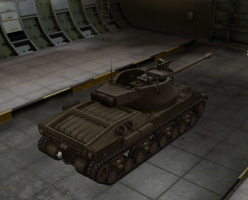 The T28 Prototype leads to the T28, and the T30. From 9.15 patch on, it was modeled with an enclosed turret. It's more resistant to SPGs and can use Improved Ventilation. 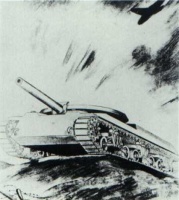 It is very similar to the T28, especially in its speed. While flat surfaces are 51mm thinner than that of the T28, these are still roughly proof against most medium tank guns in tier and most guns below its tier. With its fast firing 120mm cannon and good gun depression, the T28 Prototype shouldn't be underestimated, especially in hull-down position. Its closed turret also makes it more resilient to artillery, but make sure you're staying in cover as much as possible to increase the odds of survival. Yet it's important to note that the turret can only traverse a total of 286° degrees, which can be a major disadvantage if a medium or light tank gets to circle you. 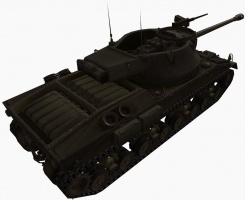 Also, its side armor, even if seemingly rather angled, won't necessarily deflect anything as it only holds 50.8mm of thickness, which translates to only little more than 100mm effective thickness outside auto-bounce range (sides no longer are overmatched by 152 mm shells, since the thickness was increased by 0.8mm). As for prototype users, don't expose your sides when facing the front unless it's necessary to do so. 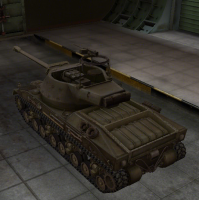 Although a great supporter, if top tier, it can brawl and beat even some tier 8 heavies. Most of them cannot reliably penetrate your front without resorting to weakspots, but only brawl if a flank was left open or your team's heavies were destroyed. As a sniper, it will devastate tanks out in the open. Shooting unsuspecting tanks will scare the crap out of them, Especially when top tier. The 120mm gun's reload is outstanding. Many expect it to take longer than 9.68 seconds, and will leave themselves exposed because of this. You will need to take advantage of this, as it will allow you to deal a lot more damage. Flanking, however is still a problem. The turret traverse and hull traverse combined is still too slow to keep up with the faster ones. One daredevil tactic to use on flankers is to turn your hull into them. This will wipe out at least their tracks, if not reducing their HP pool greatly. But if you miss the flanker, you will have blown your chance to defend yourself and should only be done if support is coming and you have full HP. You should aim to unlock both guns before moving on to anything else. The starting gun is wholly inadequate, while the 120mm makes you a destroyer of worlds. If possible, use free XP to get the 105mm gun so you don't have to use the 90mm. 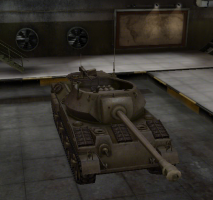 Alternatively, you can unlock the 105 mm on the T25 AT. 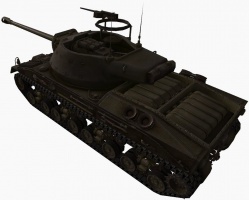 It is generally agreed the T28 Prototype as it exists in the game is considered to be a fabrication based on liberties taken with various T28/T95 program proposals. This page was last modified on 23 December 2018, at 15:15. This page has been accessed 437,480 times.